The Finnish Safety Investigation Authority reports that inadequate CRM, darkness and special runway and taxiway characteristics were factors in a serious incident in which the crew of an Embraer 190 jetliner initiated a takeoff from Oslo-Gardermoen Airport, Norway while being lined up with the runway edge lights. An Embraer ERJ 190-100LR passenger jet on Finnair’s scheduled flight FIN658M collided with three runway edge lights during take-off at Oslo-Gardermoen Airport, Norway on Saturday, 23 October 2010. There were 4 aircrew members and 31 passengers onboard. During take-off the tyres on the left main gear and nose gear collided with the runway edge lights. The tyres sustained minor damage and the runway edge light fragments were flung into the right engine, causing strike damage. According to the observations of the pilots, the aircraft and its engines operated normally at take-off. The take-off run was continued and the aircraft’s course was corrected to the runway centre line. ATC confirmed that the airplane had hit runway lights. The flight was continued to Helsinki-Vantaa airport, the destination. The damage to the main gear tyre was detected during a post-landing inspection, but the damage to the nose gear tyre and the engine was only discovered after the aircraft had been taken to the maintenance hangar for the main gear’s tyre change. The damage was so substantial that the engine and both tyres had to be replaced. 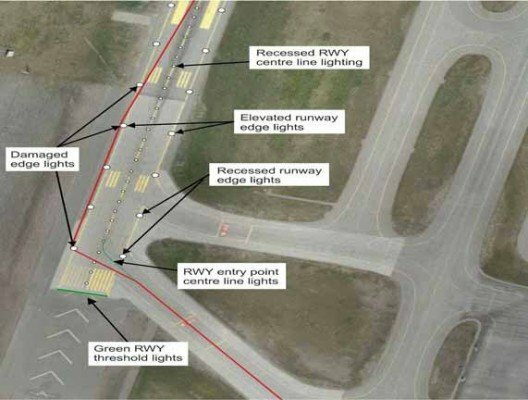 The Safety Investigation Authority concluded that the cause of the serious incident was the fact that the flight crew mistook the left runway edge lights for the centre line lights as they were lining up. Because of this, they commenced the take-off run on top of the elevated runway edge lights, resulting in damage to the lights and the aircraft. Inadequate CRM was a contributing factor. Other possible contributing factors included darkness as well as the special characteristics of the taxiways, runway and runway safety areas. Unsatisfactory radio phraseology and ATC clearances as well as a rapid rate of speech may have caused subconscious haste of the flight crew. The investigation commission issued six safety recommendations. Two were directed to the Finnair Group. They deal with confirmation of the correct runway and take-off position as well as flight crews’ readiness for departure while taxiing into position. Four of the recommendations were issued to Avinor AS. The recommendations concern the rate of speech in radiotelephony, aerodrome Hot Spot comments, the reporting of foreign object debris in the movement area to pilots/operators as well as to create a guide for the documentation of foreign object debris in the movement area.